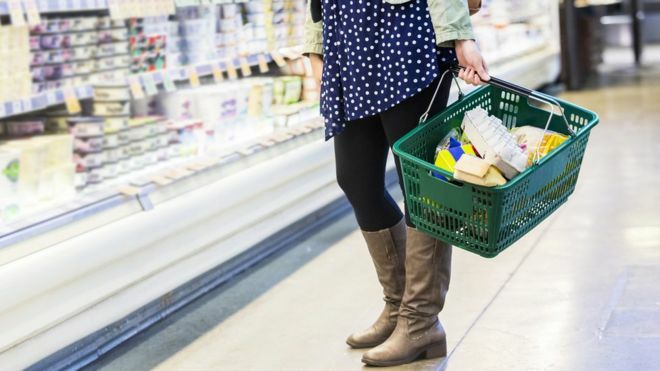 Brexit brings risks of food shortages if the UK does not resolve issues around customs processes, the British Retail Consortium (BRC) has warned. While the UK has outlined its vision for customs arrangements after Brexit, the retail trade body said it was still waiting for crucial details. It said European supply chains were “key” to delivering everyday goods. But Brexit campaigners said technology meant there would be “no need for hold-ups at borders”. Prime Minister Theresa May has said she wants to avoid a “cliff-edge” for businesses when the UK leaves the European Union in March 2019. The BRC called for significant investment in ports and transport infrastructure to ensure new systems are ready when Brexit takes place. It also said agreements were needed to prevent goods being held up at the border because of extra checks. “Whilst the government has acknowledged the need to avoid a cliff-edge after Brexit day, a customs union in itself won’t solve the problem of delays at ports,” said the trade body’s chief executive, Helen Dickinson. The body said disruption or additional costs would “affect availability on the shelves, increase waste and push prices up”. Earlier this month, the UK government produced a paper setting out two proposals to replace its membership of the EU’s customs union. The first was an “innovative and untested approach”, which would mean no customs checks at UK-EU borders. Its alternative proposal – a more efficient system of border checks – would involve “an increase in administration”, it admits. European Commission President Jean-Claude Juncker said on Tuesday that none of the UK’s Brexit papers provided so far were satisfactory. If the UK leaves the EU without a trade deal or a transitional period – something the government has said it wants to avoid – that could result in delays of up to three days at ports, the BRC said. It added that 180,000 extra firms would need to make customs declarations for the first time. However, Patrick Minford, a Brexit campaigner at Economists for Free Trade, rejected the BRC concerns. “Modern computerised customs procedures are something the EU must by international law put in place for the UK as a sovereign state with its own customs authority post-Brexit,” he said. “It is also necessary for the UK government to make sure that HMRC has installed all the necessary computer and other systems to handle trade with the EU as a foreign customs authority. “There is no need for any hold-ups at borders, provided both the EU and HMRC take these necessary actions, which they should be preparing already,” he said. And Jamie Whyte, director of research at the free-trade think tank, the Institute of Economic Affairs, said: “If the UK leaves the customs union, barriers to the entry of imports are entirely a matter of domestic policy. “This gives the government a huge opportunity to make importing as easy as possible, not only from the EU, but from the rest of the world. “UK consumers will benefit enormously from the lower prices which would ensue,” he added.